This story was published in November, 1942 in Amazing Stories magazine. It’s the first story by Raymond Z. Gallun that I’ve read. 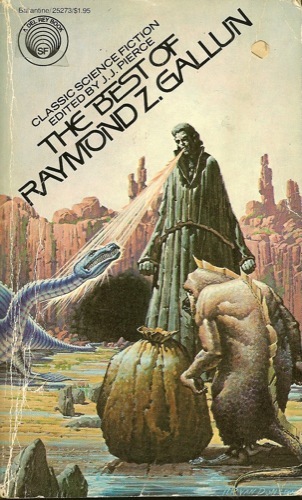 I was happy to come across it, since I recently ordered the Del Rey The Best of Raymond Z. Gallun paperback. Love those books. “The Eternal Wall” is not included in that collection, which raises my expectations of the stories that were included, because this is a very good story. It starts with a guy driving a car quickly down the road. He’s late for a date with his girlfriend, so he pushes it too far and ends up flying off a cliff into deep alkali-rich water. Now pick up the story a few million years later. Humans have long since left the Earth, and the next phase of evolution has resulted in a race of prairie dog-like intelligent creatures that find a mummified body at an archaeological dig. Their technology is great, so they figure out how to re-animate the well-preserved body. The end of the story didn’t ring true to me, but it contained the point of the story, or at least the reason the story was titled “The Eternal Wall”. The wall is time – the main character can’t go back in time, and the new intelligent life on Earth, despite their advanced technology, can’t do it either. It can easily be seen as a response to the time travel stories that permeated science fiction in the 40’s – a dose of scientific realism, perhaps? But it’s not the view of time presented in the story that doesn’t ring true – it’s the reaction of the man after being re-animated. Oh, the drama! I wanted to slap him. Gregg Margarite performs the story, hysterical re-animated man and all, and I’ll be looking for more from him. Thanks to Gregg, and thanks to Librivox for making it available! A reminder – Librivox is looking for your help! Seven people, all headed to the planet Hyperion to visit the Shrike, find themselves on the same ship. Regular pilgrimages are made to the Shrike, but these seven have been granted a visit to the Shrike together. To find out why this is, they all agree to tell each other their personal stories of what brought them. The result is a Canterbury Tales in space. A priest, a soldier, a poet, a scholar, a detective, and a consul each tell their story; all separate, all intensely personal, all very different, yet all involving the Shrike in some way. The book is set in the distant future, and the ideas are plenty. There’s farcasting, where doorways are created to other worlds. One character has a house where every room is on a different world. Costs a fortune, but it can be done. There are artificial intelligences, starships, and sims. Against this backdrop is the Shrike, an alien creature that lives in the Time Tombs, and the seven on a pilgrimage who land in a city on the planet Hyperion, then make their way to see the Shrike over land. “Pilgrimage” is definitely the right word here, because the whole book has a mythic-religious quality. Each person is dealing with very difficult stuff, and what each person hopes to gain from the Shrike when they finally get to see it is nothing short of intervention of a higher power. Audible Frontiers did a wonderful job with this audiobook. It used to be available only through Audible, but now Brilliance Audio is offering a hardcopy version on CD, which is how I listened. Each story is told by a different character, and each one uses a different narrator. The narrators were all excellent, so this is a perfect presentation of this book. All seven of the stories are fascinating, well-written stories. There isn’t a weak one on the bunch. This is a top-shelf science fiction novel, up there with the greatest books of the genre. Highly recommended, without question an SFFaudio Essential! 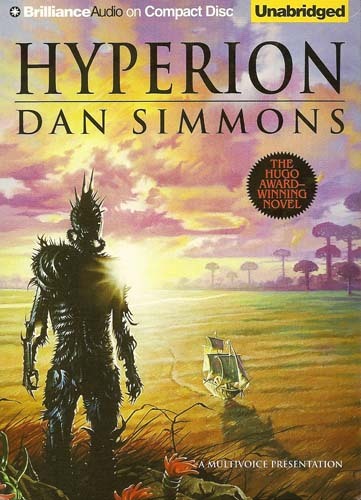 The single caveat is that you must plan to read the next book in the Hyperion Cantos, (called The Fall of Hyperion), because the story doesn’t end with the end of this book. The Fall of Hyperion is also available from Audible (digital) and Brilliance Audio (CD), as are the two books that complete the series, Endymion and The Rise of Endymion. This is the only one I’ve read, but I expect I’ll be reading them all. This Hugo Award winning novel (2006) is a novel of two parts in my mind. The first, which involves the covering of the entire Earth with a complex membrane, is some of the most exciting hard science fiction I’ve read in a long time. Picture yourself lying on a lawn, looking up at the stars… and they go out. As awe-inspiring as a Clarke novel, Wilson tells us what the world’s scientists come up with as they try to answer the big questions. What is happening? Why is it happening? Is there a “who” behind it? An outline of this book could be written that would look like a knotted string, each knot being an important and sometimes jaw-dropping idea. “The Spin”, as the phenomenon is called by the characters, grips the Earth tightly and apparently permanently. Initial discoveries find that the membrane has created a time difference between life on Earth and life in the rest of the universe. A minute passes here while years pass out there. A few days of time here, and empires would rise and fall outside, if they existed. Do they? The story is about three main characters. Jason and Diane Lawton are the twin children of an entrepreneur. Tyler Dupree, the first person narrator, is a close friend. The three, as children, witness the beginning of “The Spin” together, lying on a lawn at a party attended by their parents. 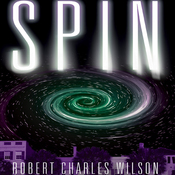 The event alters their lives, and the lives of all humans, but time marches on, the kids grow up, and, though each one lets “The Spin” define their lives, they each deal with the new reality in a completely different way. It is there that my appreciation for this aspect of the novel lies; how different we all are, and how different our reactions to the very same event. Some turn to religion, some turn to science, some to their business, and some to help their fellow man. I’m not a person who dislikes a good character driven story. If I’m reading a piece of fiction that’s not genre, I’m likely to be reading something from the general fiction section of the bookstore, as opposed to mysteries or military thrillers. But still, I found it difficult to focus on parts of this novel, probably because I was listening to a story largely about people reacting to “The Spin”, rather than a story about the people that were actively trying to figure it out. Though one of the three main characters is indeed a scientist that is deeply involved, I wasn’t hearing a story about those scientists and exactly what they were doing. In other words, a lot of really interesting stuff is happening off stage while the novel was focused elsewhere. Scott Brick narrates, always a plus from my perspective, and is a great match with this book. He does very well with science “ooo wow” moments, and there are plenty here. A quibble for the accuracy department: a mispronounced word that unfortunately is used often during a portion of the book. “Oort cloud”. All in all – another fine audiobook from Macmillan Audio – it is available exclusively as a download from Audible and iTunes. 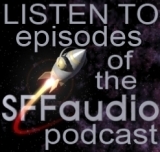 The Journal of Science Fiction In Philosophy is a spin-off from the Sci-Phi Show podcast. The short introductory editorial, written and read by the journal’s editor Jason Rennie, defines what the journal will be about using examples from film and television – but despite these examples the stated focus is on making the journal more focused on the literary side of Science Fiction. Next up, “What Is Sci-Phi” (introductory article) by Jason Rennie; read by TD-0013, introduces the philosophical content of modern Science Fiction. The stories are followed by “questions for reflection” which are a series of questions designed to provoke the philosophical spirit in the listener. “Irwin Goes To Hell” by Jason Pomerantz is the first piece of fiction in the journal; it is a humorous and surrealistic tale of a hapless suitor determined to break all ten of the Ten Commandments. But the joke runs a little long with so many commandments to break and so many trips to hell (and heaven). Geoffrey Maloney‘s “The Oracle In The Red Limousine,” read by Nathan Lowell, the next short story, offers a small reflection on the idea predestination and a large handful of humor. “Requiem for a Harlequin: Two Perspectives on Time, and a Celebration of Kairos, in Three Stories by Harlan Ellison” by Michael Spence is a commentary on what he sees as a previously unnoticed theme in Harlan Ellison stories. Warning, pre-reading of the three Ellison tales is definitely required. “You Pretty Thing” by Lee Battersby (and read by Rick Stringer) is short, unmemorable, fleeting. This, despite having some weighty ideas (life after death, cloning, consciousness-downloading). “Requiem for a Silent Planet” by Stephen Dedman, read by TD-0013, stands out (with lines like “I’m loaded for pope.”. This one is an intriguing listen right up until its very abrupt end. This story feels terribly unfinished – which is a real shame. Likewise, the serialized piece “The Big Questions” by Stephan Vladimir Bugaj and Ben Goertzel, read by Jeffrey Kafer, starts with a moon-smashing bang. It is a snappy first person tale of a head in the clouds solipsist asking many of the traditional questions of metaphysics – many questions, few answers – perhaps some will come in future issues of the journal. “A First Look at Lookism” is an article with an argument at its center. The subject of which is an exploration of the “morally inappropriate discrimination,” phenomenon of visual discrimination. The author, Ryan Nichols is an assistant professor. He examines the moral status of lookism with special reference to a piece of literary science fiction (namely Ted Chiang’s Liking What You See: A Documentary). Nichols surveys the terrain and then mulls over an argument that he thinks may show precisely why lookism is so wrong. He’s thorough and the article runs about 25 minutes. Next, “The Losting Corridor” by Matt Wallace, read by Drew Beatty, offers a dreamy entrance into a Twilight Zone-like world. A hardboiled detective on the trail of a shooter winds up in a Platonic blind-alley that he may never escape from. The tale is gritty and well written, but ultimately it is a shallow mirror pointed at a past that never was. Finally, the issue is capped by “The Epilogue” which is, despite its title, actually a fiction piece. It’s an eight minute tale, by The Rev-Up Review‘s Paul S. Jenkins. A cryptic worldwide broadcast by an anonymous grey-bearded sky guy proves once and for all that the atheists were wrong, and will be right. Well written, but more of an exercise in storytelling than a story. Magazines by their nature are extremely hard to review (their many small components needing to be examined in detail). There is something in the essential character of magazine reading that is always more ephemeral than novels or short stories alone. That said, after reading over what I’ve written above, it appears I have been more damning than praising – had I been merely a casual reader looking for something to listen to I bet I’d have been far less so. So let me clarify, for the first issue of a magazine the Sci Phi: The Journal of Science Fiction In Philosophy – January 2008 is extremely well put together. It doesn’t have any real dead weight, and I eagerly look forward to listening to future issues. You have no idea how screwed up this is. All the Star Trek talk floating around the internet has stirred my interest, so I dug out one of the first (and best) Star Trek audiobooks from my permanent stash. I sit here with hopes that the Paramount powers-that-be stop considering prequels. Does anyone want to see someone other than Nimoy play Mr. Spock? The future is wide open – pick a place out there and tell some great stories. Before a cane stretches out from stage left to drag me off, I’ll get back to the review at hand. 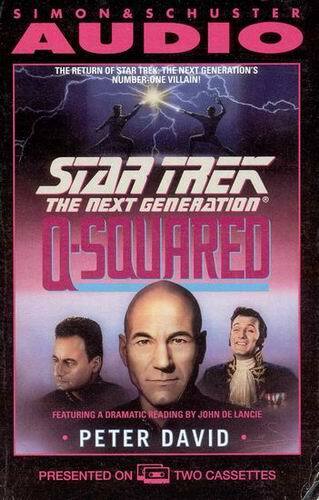 Q-Squared has everything I love in a Star Trek audiobook. First, it’s a big story. One that would be difficult to film for various reasons. Second, there are lots of pieces of Star Trek mythos throughout. You know, the kind of thing that makes a Trekker think “I remember that!” and sends him/her to watch the episode it occurred in. Third, the sound effects create the Star Trek feel without being overpowering. This is a luxury that these audiobooks have – the sound of a turbolift door, a few beeps, and the listener is on the bridge of the Enterprise without a sentence of prose. And fourth, an excellent reader. John de Lancie not only voices Q, the character he played on the screen, but he also skillfully portrays all the other characters. In the book, Q has been given the difficult task of keeping an eye on Trelane who is a character from the Original Series episode entitled “The Squire of Gothos”. Peter David makes quick work of connecting Trelane to the Q Continuum. Unfortunately for Picard and crew, Trelane is even farther off plumb than he was in Kirk’s heyday – a fact demonstrated by the fact that he considers ripping apart the universe to be a valuable use of his spare time. To the Star Trek: The Next Generation characters, this results in the intersection of at least three well-conceived alternate universes. As the story moves forward, the universes flip like cards being shuffled in a deck. Luckily, the audiobook is brilliantly abridged and edited. Though the universes shifted quickly, I had no problem keeping one Picard from another. This audiobook, if it was a Star Trek episode, would consistently be considered one of the finest the show had to offer. There are lots of copies of this one around – I urge you to find one. It is one of the fundamental constants of the universe – every second thrift store one enters will contain a lonely shelf somewhere in the back with a battered paperback copy of Chariots Of The Gods? by Eric von Däniken on it. That is a terrible, terrible book. I encourage you – only partially in jest – to burn down any store that has one. Chariots Of The Gods is a massive failure in every way but one, it’ll help me tell you about a certain 1970s pop culture concept – the “ancient astronauts” theory. This is a speculative/delusional hypothesis that posits that extraterrestrial aliens are responsible for the ancient civilizations of Earth. Basically it argues that ancient people with their distinctive lack of heavy diesel powered machinery, could not possibly have constructed things like the Pyramid of The Sun at Teotihuacán and so the relics of archeological wonders throughout the world must have been constructed by aliens with a ‘higher’ technology. It is of course a ridiculous notion, wholly unsubstantiated by any evidence that wasn’t manufactured by fraudsters. That said, it can occasionally makes for a cool basis for fiction. 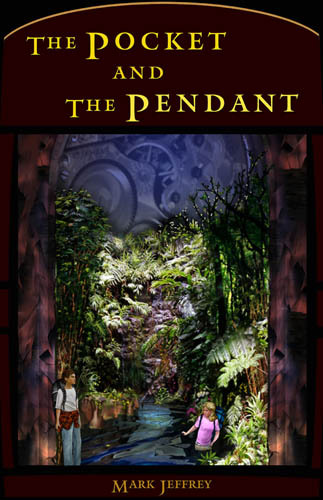 Mark Jeffrey’s The Pocket And The Pendant uses the concept of ancient astronauts to very good effect. This is the story of Max Quick a very odd little boy and his companions, other children who’ve found themselves trapped living in a frozen instant of time. Has this time “pocket” has been caused by the strange aircraft in the skies above the USA? What about the almost magical books that everyone who isn’t frozen seem to be after? Only the aptly named “Mr. E.” knows the answer. Weaving together a carefully researched history with an intriguing and well executed scenario Mark Jeffrey has put together an engaging and satisfying adventure that while aimed at a younger audience never talks down to it. Basically Jeffrey does for science fiction what Harry Potter does for fantasy – I’d say he does it better by layering in facts and mythology from many sources. He takes the whacked out theories of Zecharia Sitchin and asks “what if they were true?”, mixes it up with action like The Matrix, the premise of the Doctor Who “Key To Time” arc and with a couple dutiful nod to the 1959 and 1985 The Twilight Zones. Jeffrey is very inventive with solving the problems he’s created. But there was one thing that bothered me about the story, if Max and his companions are trapped in time how can they see? Let me explain, this is basically the same nitpick I had with H.G. Wells’ The Invisible Man, without light hitting a retina you can’t see. If time is stopped then the light has stopped (in The Invisible Man the title character’s retinas are transparent!). I’m nitpicky. Jeffrey reads the novel himself, doing accents, adults children boys girls and aliens. The sound quality is very good and well leveled, but there is one caveat, a constant musical score underlies the reading (almost always keyed to characters and events in the tale). In this case it is fairly benign, and certainly allows an atmosphere of emotion to build in the story – but not having heard the tale without music I’m not sure if it wouldn’t have been better just as a clean reading. SFFaudio COMMENT: This is the second “Podiobook” we’ve reviewed on SFFaudio, and the quality is WAY, WAY UP THERE, not just in terms of podcast novels, but in terms of novels on audio. Combine this fact with the price, which is just a request for a donation if you enjoyed the experience, and you’re literally crazy by not listening to them. The worst that can happen is you listen, enjoy the heck out of it and then feel guilty for a few years because you were to cheap to throw a few $$$ towards the producers. Go ahead now, give yourself a gift, subscribe to Morevi: The Chronicles Of Rafe And Askana and The Pocket And the Pendant you’ll marvel at your own generosity.